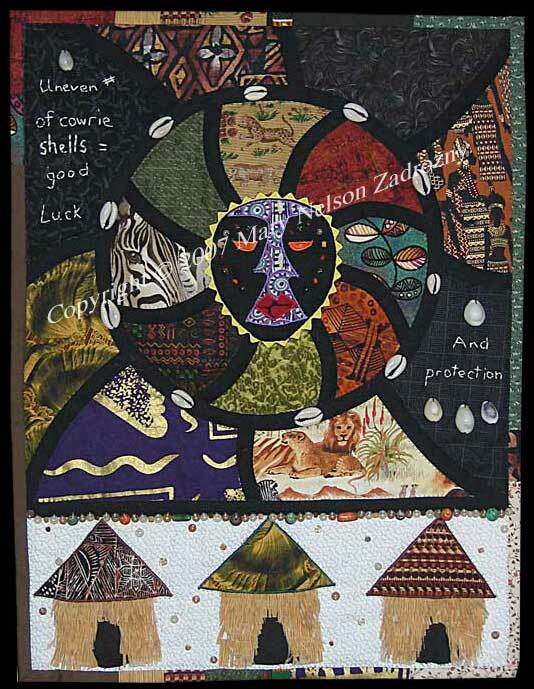 Title: "Luck Of The Cowrie"
Quilt Description: This quilt evolved while working on the Carousel and Behind The Mask quilts. The huts are made of layers of fringed fabric. While embellishing the quilt with cowrie shells, I learned that an uneven number had positive connotations so I decided to work that into the design itself. Cowrie (also spelled Cowry) shells were the most popular currency in Africa with many other uses in every day life; including payment of fines, in games, plus ornamentation on clothing, drums, masks and furniture. They are symbols of wealth, prestige, fertility, womanhood, and birth. This quilt took 48 hours to create. Materials: Cotton fabrics, polyester batting, embroidery floss, yellow rick rack. Embellished with beads, cowrie shells. Techniques: Fusible Applique, Needle Turn Applique, Hand-Embroidered, Hand-Quilted.